One of my favourite nutritionists and experts is Marisa Peer. I met her when I was working at Men’s Fitness Magazine after seeing her on Channel 4’s Supersize vs Superskinny. She hypnotised Anna Richardson to eat less food and lose weight – and she did. The whole show was about Anna trying different diets – from eating baby food to living on lemon juice and maple syrup and you know what – Marisa’a hypnotherapy proved to be the most effective weight loss method. This fascinated me! I then attended a few of Marisa’s workshops and met her personally when I wanted to give up chocolate. After an hour’s session, i gave it up completely for over 12 months and never looked back. The power of the mind is a great tool when you know how to control it. 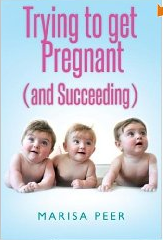 When thinking about trying for a family – it made complete sense for me to read Marisa’s new book ‘Trying get pregnant (and succeeding)’. Marisa has such a positive outlook on everything and certainly knows her stuff. The book covers everything from nutrition to positive thinking and after writing down lots of positive affirmations and sticking them on my walls and mirrors (somewhere where you can look at them everyday) I felt more optimistic. I also tried new supplements (to be covered in a later post) and listened to her CD at night just before bed. As Marisa says, ‘what your mind says, your body will eventually follow’, so I continued to tell my body what it was going to do and had lots of positive thoughts. I would certainly recommend this to anyone looking to start a family. Your mind is so powerful – you could be the most healthiest person in the world but if your mind isn’t ready to accept children in to your life and the changes your body has to go through to get there, then your body won’t be!